Antarctic Fur Seals are most commonly seen on the Antarctic Peninsula and sub-Antarctic islands to the north. Antarctica is inhabited by very few terrestrial vertebrates. The marine species in the region rely on phytoplankton while the sea life includes whales, seals, penguins, and colossal squids. More than 250 organisms live within the Antarctica. The large animals including mammals and reptiles make an annual round trip from one polar region to another either for food or a favorable climate. The region is characterized by several mammal species. Some of these native mammals of Antarctica are looked at below. The Antarctic Fur Seal, or Arctocephalus gazelle, is a seal in the genus Arctocephalus in the subfamily Arctocephalinae. 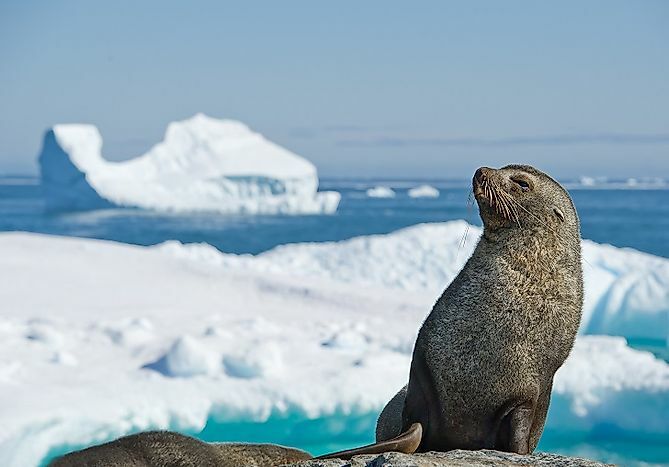 The seal is distributed throughout the Antarctic Water with over 90% of the world population breeding in the South Georgia Island. The Fur seal was named after a German vessel, the SMG Gazelle, which was the first to collect it from Kerguelen Island. Antarctic Fur Seal has a shorter and broader snout compared to other seals in the family. The males are dark brown while the female are gray with lighter underbelly. The male is bigger than the female and can breed with a dozen female partners in a single season. The female has a gestation period of roughly one year with the pups weaned at four months. Antarctic Fur Seal feeds on krill and fish. The Sei Whale, also known as the Balaenoptera borealis, is the third largest rorqual inhabiting the deep offshore waters of many oceans and seas. An adult Sei Whale is 20 meters long, weighs 18 tons and consumes an average of 900 kilograms of food daily. Its diet consists of krill, copepods, and zooplankton. Sei Whale’s body is dark gray with white markings on the ventral surface. The skin is marked by wounds which heal to form a white scar. Its dorsal fin is sickle-shaped while the tail is thick and lobe relatively small compared to the body. Sei Whale is distinguished from other baleen whales by the absence of the lateral ridges on the dorsal surface. Sei Whale uses its baleen plates to obtain its food by widening its mouth thus taking in a great deal of water in the process. The water is then strained out through the baleen. This whale mates during the winter season with an estimated gestation period of 11 months. The young one is weaned after 7 to 10 months. The Spectacled Porpoise (Phocoena dioptrica) is a rare member of the Porpoise family. It is easily distinguished from the other porpoises by the presence of a dark ring around the eyes. Spectacled Porpoise has a small head with no beak. It has a distinctive black marking above and white marking underneath the body. The upper surface of the tail is marked by white strip. Its dorsal fin is rounded and has no break. Spectacled Porpoise can grow up to a weight of 85 kilograms, but the age of maturity cannot be accurately estimated. Spectacled Porpoise is an active swimmer, very fast, and can easily evade the boat. The Hourglass Dolphin (Lagenorhynchus cruciger) is a dolphin in the Delphinidae Family, and it is a rarely seen species. The dolphin is colored white on its beak, eyes, and flippers and black on the rest of the body. A fully grown Hourglass Dolphin is 1.8 meters long and weighs around 120 kilograms. The dolphins move in groups of 10 and shares feeding ground with other cetacean. The conservation of Hourglass Dolphin is under the Memorandum of Understanding for Conservation of Cetacean and Their Habitats in the Pacific Island Region. What Animals Live In Antarctica?